During the spring of 1995 I caught my first Archers Of Loaf gig, not something I’d soon forget. Witnessing them open for a certain be speckled buzz band of the time, was so impressive that I exited the venue prior to the Happy Days themed video stars first song. Since then Archers Of Loaf have broken up and reunited only to be retired again. 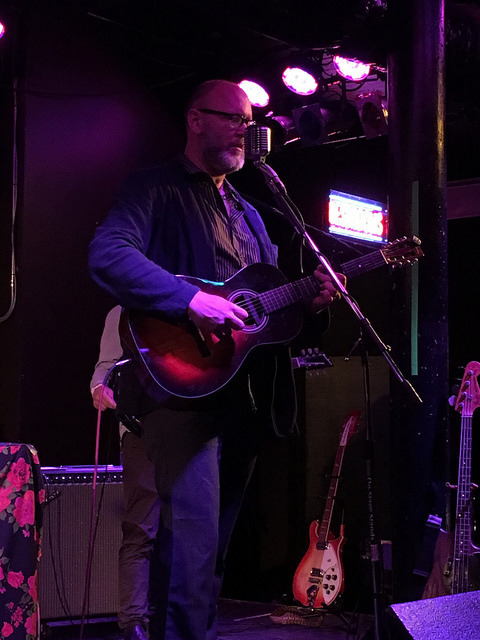 During this time front man Eric Bachmann has built an impressive solo career, with various recording vehicles such as Barry Black, Crooked Fingers, and most recently releasing a self-titled LP under his own name which follows 2006’s To The Races and has been met with commendatory reviews. Eric Bachmann is currently out on the road supporting his latest release, so on Wednesday my wife and I hopped into the car, (because every blogger deserves a lovely co-pilot) and made the short drive across the state line into our country’s smallest state to catch Eric Bachmann at The Met in Pawtucket, R.I. With little notice or fanfare Eric walked on stage with a workman like fashion and sat behind his keyboard draped in a rose covered cloth and launched into a stark and albeit hair raising performance of Modern Drugs. From there Bachmann was accompanied by an accomplished backing band and two female backing vocalists. The first half of the set was dedicated to the new LP with Bachmann turning in stunning renditions of Dreaming, Carolina, and a goose bump inducing version of the albums lead single, Mercy. With Bachmann alternating between keyboard and bass most of the evening, the second half of the set found him digging into his Crooked Fingers catalog, for standout performances of Crowned In Chrome, You Can Never Leave, and Sleep All Summer. The set came to a close to the cheers of the small but attentive crowd with the throbbing bass groove of Archers’, White Trash Heroes. One thing that struck me all night was that reportedly Eric Bachmann considered walking away from music prior to recording his eponymous new LP, which would’ve been a shame given the strength of the material he continues to release and the dynamic live performance I was thrilled to witness in Pawtucket on a Wednesday night in April .